Sydney Olympic Park Sports Halls (A) - Indoor Soccer, Indoor Netball, Indoor Volleyball. Change Rooms and Showers available. Quay Centre (B) - Backup venue for Indoor Soccer, Indoor Netball, Indoor Volleyball. Change Rooms and Showers available. These venues are managed by the Sydney Olympic Park Authority. 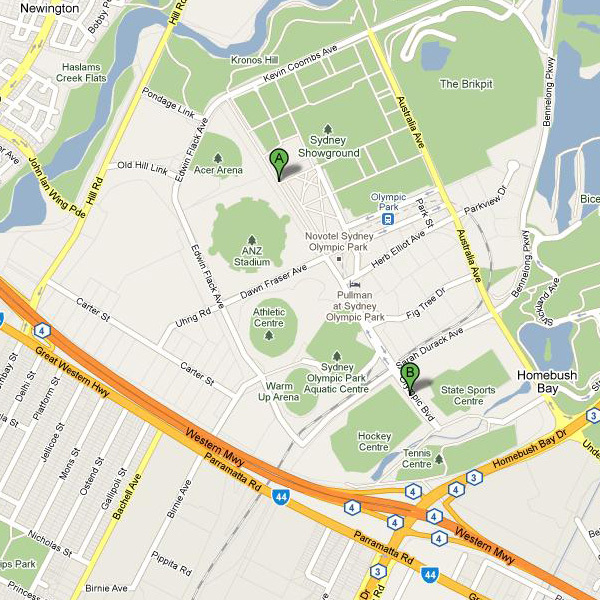 Sydney Olympic Park Sports Halls - Cnr Olympic Boulevard & Grand Parade. Quay Centre - Cnr Olympic Bvd & Sarah Durack Ave.